Check out some of TG's favourite bookmarks! We appreciate that not all of you will embrace classical guitar, but there's a whole world of brilliant guitarists out there. The Classical Guitar Blog's author Christopher Davis does a good job of highlighting some of the genre's key players. The Classical Guitar Blog is also used to instruct and Christopher has recently completed a Master's Degree in Music (check out his recital). "I wrote a ton on online guitar forums and was always quick to offer advice for beginning players, so it seemed like a good idea to start my own site on which I could do the same thing," he told us via email. "Since then the CG Blog has turned in a major vehicle for my own career as a guitarist. I sell an ebook of arpeggio studies and I use the connections I've made and knowledge I've gained to book recitals and lectures. The biggest thing I get out of it is codifying my ideas. Something happens when you write on a topic - it has to be extremely clear in your mind." "The CG Blog also acts as my person journal of progress, and, as I look back on the last few years of it, the blog reflects what I was working on at the time. During the spring and summer of 2009, for instance, I was very interested in practicing and wrote a ton on the subject. Now I've been working quite a bit on technique, and I'm posting more frequently on that after avoiding it for a while." "Over the coming years I plan to continue doing what I'm doing now, and expand in different ways. The interviews I do are going to be published via podcast as well as video, and I hope to bring in more guest posters and authors. And of course, as I gain more influence in the classical guitar world, my interviewees will be bigger names." 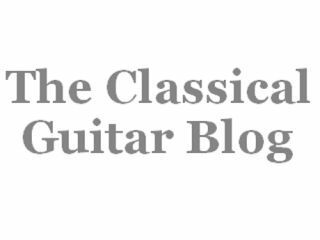 Check out The Classical Guitar Blog and make sure you head back this way for more of TG's Blogs Of The Week.